REAL CLUB DE GOLF EL PRAT HAS A CODE OF CONDUCT THAT ALL PLAYERS MUST BE AWARE OF AND COMPLY WITH DURING THEIR TIME AT THE CLUB TO ENSURE CORRECT PLAYING PROCEDURES AND RESPECT FOR BOTH OTHER PLAYERS, AS WELL AS THE CLUB’S FACILITIES. 1.1. 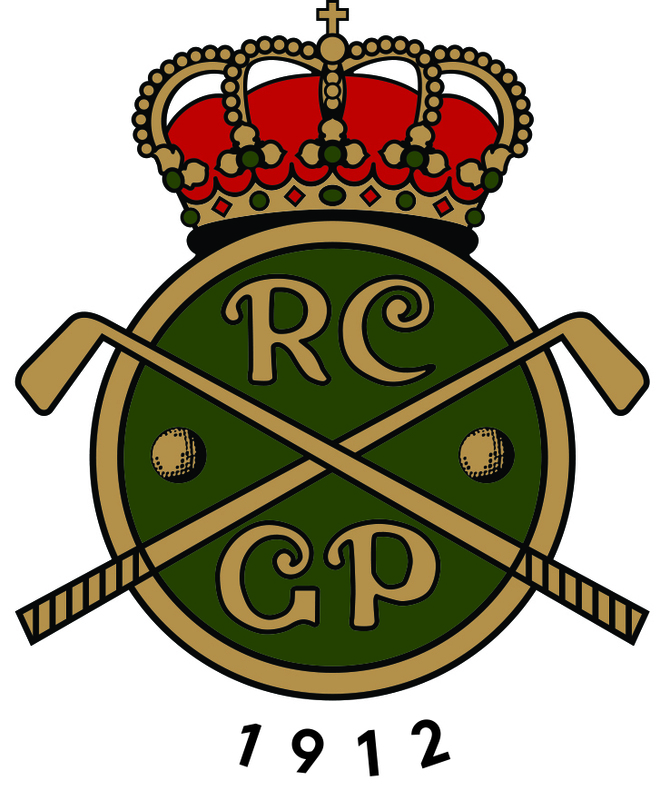 All players using RCG El Prat’s facilities must be aware of and are required to comply with the Rules of Golf, the Spanish and Catalan Golf Federation Rules and the Rules of Etiquette. Ignorance of these Rules is no defence. 1.2. Players must follow and abide by any indications given by Club employees, who represent the Club Management and whose mission is to enforce its instructions. 1.3. This rule shall apply in particular in relation to starters, marshals and persons in charge of the driving range, as well as the members of the sports office and reception personnel in charge of organising tee times. All these individuals act on direct instructions from the Competition Committee. 1.4. The Competition Committee may exceptionally, depending on special circumstances, change these Rules. 2.1. Replace divots on the fairways and tees. 2.2. Rake the bunkers and return the rake to its place. 2.3. Repair any pitch marks or ball indentations on the green. 2.4. Mark balls on the greens with adequate place markers or coins, making sure not to mark the ball or pit the surface of the green with tees or other sharp objects. 2.5. Not bend the cup out of shape when removing or replacing the flagstick. In particular, refrain from using the putter to retrieve the ball from the cup. 2.6. Avoid making divots while taking practice swings, especially on tees and fairways. 2.7. Not practice pitches on greens and putting greens. 3.1. Players must follow golf cart driving rules and keep well within the cart paths, always keeping to areas marked with ropes or signs. 3.2. Cart paths should be crossed at right angles, following the 90-degree rule. 3.3. Cars should be occupied by two people at most, and must never be driven by anyone under age-16. 3.4. Groups using carts do not have preference over other groups. 3.5. It is forbidden to drive carts onto tees or within 10 yards of the fore-greens. 3.6. At the Competition Committee's discretion, golf carts may not be driven on the course when there is ice or excess water due to weather conditions. 4.1. Weekends and holidays: At least one of the members of a group must register and sign the lists at the Club reception to assign a tee time. Only one tee time may be registered. Any change must be justified and reported to the reception. The tee time reservation fee will be charged automatically. Any absent player or players (if the competition is pairs) will be excluded from the next competition in which they register to play, regardless of whether it is individual or pairs. Should any of the partners fail to appear at the scheduled tee time in any further competitions, whether individual or pairs, they will be excluded from registering in three subsequent events. If the failure to appear on time re-occurs, they will be forbidden from competing for a period of time determined by the Competition Committee, which in no case will be less than one year. The foregoing shall be notwithstanding application of the Club Sport Discipline Rules where applicable. 5.1. On weekends and holidays, four-player parties will have preference over groups of three, and these will have preference over pairs. A single player is not deemed a party. Parties of more than four players are forbidden. 5.2. On weekdays, pairs will have preference over parties of three, and these will have preference over parties of four. A single player is not deemed a party. 5.3. The order of holes established for the course must be followed and not played arbitrarily, skipping holes or changing the course. Players searching for lost balls must let the next group waiting its turn play through. Play-through should also be allowed when players are one or more holes behind the preceding party. When too many players are on the course, the rule of courtesy shall apply to par-three holes. Do not repeat shots or take practice shots during play, especially when a player or party is waiting to play the same hole. 5.5. Players are expected to cooperate in keeping the course perfectly clean. To do so, they should use the bins located by the tees. It is forbidden to leave any rubbish (drink containers, paper, cigarette butts, etc.) strewn about. 5.6. Players should avoid any attitude, gestures, words or tones of voice not in keeping with the Rules of Etiquette that apply to the sport of golf. 5.7. Both competing and non-competing players are required to follow the instructions established by the Club regarding temporary or full suspension of play and clearing of the course in case of electrical storms or the threat of lightning. Players are advised to refrain from smoking anywhere other than the tee areas, and should avoid leaving cigarette butts anywhere on the course (using the ash trays located in the tee areas). Smoking is absolutely forbidden in all wooded areas of the course. 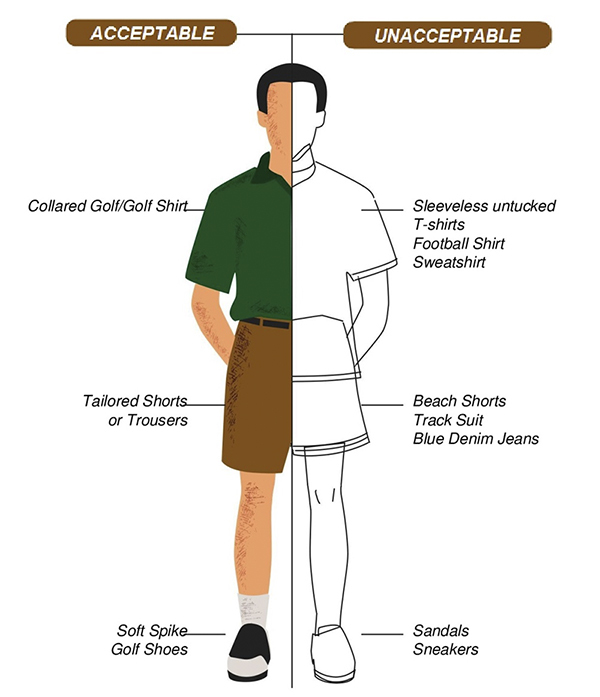 Players will wear traditional golf attire. 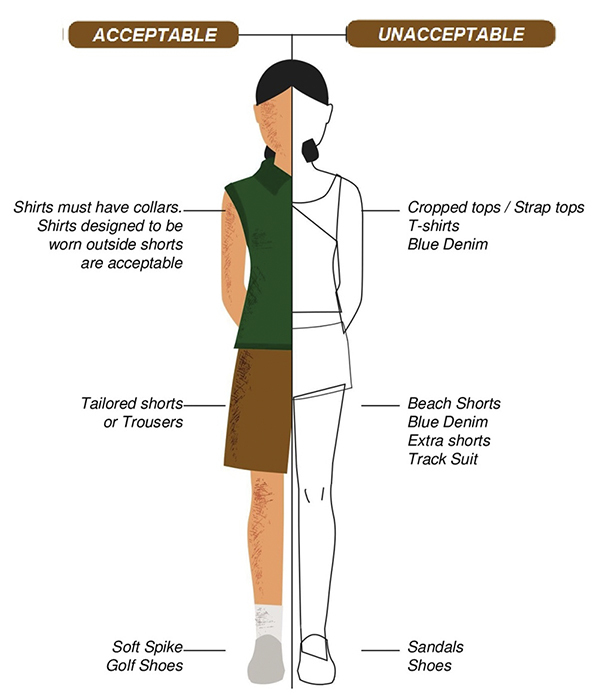 Inappropriate garments like leggings, tracksuits, bathing suits, T-shirts or similar, shorts, etc., are forbidden. Footwear should be suitable for playing golf. For course conservation purposes, golf shoes with metal cleats should not be worn unless established otherwise by the Competition Committee. Any violation will be recorded at the reception and, where appropriate, notified by the starter and penalised according to Rule 9 of this code. 8.1. Players must abide by the indications of personnel in charge of the driving range, acting on behalf of the Competition Committee to better run the facility and avoid unnecessary risks. 8.2. Practice balls should always be played within the marked boundaries and in the direction of the flags and distance markers. 8.3. Players shall abide by the Club's general schedule. 8.4. These Rules shall likewise be followed in classes with pros, who will be responsible for their compliance. 8.5. Playing with practice balls is forbidden in approach areas, and players must keep within the marked boundaries of these areas.